55" x 23" x 9"
15.75" x 10.25" x 10.25"
43" x 26" x 6"
Greetings! Many of you have asked questions about how I transitioned from a brick and mortar gallery to a virtual one and how it works to have an online gallery. In 2009, after owning the gallery in Stockbridge, Massachusetts for 31 years, I sold the gallery to Jim Schantz and Kim Saul who have done a magnificent job maintaining and building upon the tradition that we had established there over many years. I retained the website www.holstengalleries.com which is now in its 15th year. I also continued to represent most of the same artists that I had represented for many years (and in some cases since the early 1980’s). The big difference is that I no longer have a physical space to walk into and see the work in person. So when you “visit” my “gallery” you are looking at pieces by most of the same artists that you would have seen in Stockbridge, only now in virtual format. Simply stated, you are seeing images of inventory that the artists have made available to me to show and sell but which are most often housed in the artists’ studios rather than in one central location. When I sell a piece it is normally shipped directly to the client by the artist and is almost always on an “on approval” basis. I hope that this helps to clarify what I’ve been up to over the past couple of years. I am enjoying my new business model which has both advantages and challenges. I must say that I do miss seeing many of you in person and also at times the collaboration and team effort associated with owning a traditional gallery. One of my favorite series of Lino’s is the “Borneo” series. These pieces tend to be fairly simple and straightforward in terms of both color and form, yet they have an almost classical beauty and sense of harmony that make them a delight to view. This is the first one I have had available for quite some time and I’m happy to be able to share it with you. This beautiful glass sculpture by Stephen Powell is from an older series but is one of my very favorites. I’ve always loved this sensuous form and to me the colors of the murini here are absolutely sumptuous. Stephen is to be congratulated on a great honor he received just a few days ago. On March 25, Stephen Rolfe Powell received the Distinguished Educator Award from the James Renwick Gallery of the Smithsonian Institute in Washington, D.C. I know from first hand experience that Stephen is much loved by his students at Centre College in Danville, Kentucky, where he is a Professor of Art. This wonderful piece is from Preston’s Tlingit Hat series. The color, form and etched surface designs all contribute to making this work very special. As in all of Preston’s work, the figures are symbolic and form part of a narrative related to his native Tlingit culture. I’m happy to include this exciting piece by John Kiley, the first new work I’ve had from John for quite some time. To me this piece has great sculptural integrity. The form is simple, balanced and very engaging. What the reader cannot see from the image is how utterly different it is from all angles. 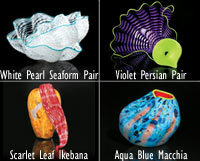 Here again are the recently released 2012 Chihuly Studio Editions. The response to this year’s pieces has been extremely positive and for good reason. Each piece captures the essence of its respective series on a scale significantly smaller than most of Dale’s one-of-a-kind pieces. By the way, the term “one-of-a-kind” can still be applied to the Studio Editions in a certain sense because each piece is still individually blown and thus has small variations in color, size and form.